Could That Burger You Ate Cause Alzheimer's? 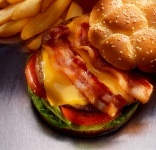 Home » General Health » Alzheimer’s in Your Burger? Saturated fats were a popular staple of the 1970s and 80s. Most people never thought twice about adding saturated fats to their meals. However, in the early 90s, a plethora of studies were released with some distressing results: saturated fats could harm us when eaten in abundance. This harm didn’t just manifest itself in our ever-expanding waistlines, but specifically in the heart. Saturated fat, medical experts told us, could seriously up our risk for heart disease. What makes saturated fats different from unsaturated fats? A saturated fat is solid at room temperature (think butter and lard). Saturated fats are commonly found in animal foods; however, there are some vegetable saturated fats too, such as butter and coconut oil. When you ingest too many saturated fats, you can up your levels of low-density lipoprotein (LDL) “bad” cholesterol to the point where your arteries become clogged. Now, new research is suggesting that every time you bite into your favorite burger, you might also be putting yourself at risk for developing Alzheimer’s. Your brain contains a chemical called apolipoprotein E (ApoE). When this chemical is synthesized by your liver, it helps transport triglycerides into liver tissue. It is also incorporated into high-density lipoprotein (HDL) and helps move cholesterol amongst cells. In your brain, ApoE has the important job of removing amyloid beta proteins before they cause dangerous plaques to form. Researchers discovered that in those who eat a high-sugar, high-saturated-fat diet, ApoE seems to lose some of its ability to remove amyloid proteins. These proteins then start to affect neuron function and the early symptoms of Alzheimer’s can appear. For the trial, researchers compared 20 seniors with normal cognition with 27 who had mild thinking problems. The two groups were randomly assigned to two diets: one which was high in saturated fat and one that was low in saturated fat. For those in the high fat group, almost a quarter of total fats came from saturated fats. In contrast, the low fat group had only about seven percent of total fat intake from saturated fats. It only took one month for changes to appear in the way ApoE cleared amyloid beta. This study highlights the significant impact diet can have on brain health. To help protect against the onset of Alzheimer’s, aim to have less than 10% of your total fat from saturated fats. Make sure to add lots of unsaturated fats to your diet to boost your overall fat intake. Healthy unsaturated fats include olive, safflower, sunflower, canola, grapeseed, flaxseed, and avocado oil. You don’t have to confine yourself to just one oil—switch it up. This way, you’ll make sure you’re getting different kinds of fatty acids into your body. A little bit of butter or coconut oil is not going to hurt you, of course, and can even be beneficial. Too much saturated fat from meat protein, however, can quickly push you over your limit for the week. Learn to enjoy the array of alternate oils that you can use. Remember that every nut potentially has an oil which can add flavor and healthy fat to your weekly diet. These include peanut oil, macadamia nut oil, and cashew oil. Be adventurous! Hanson, A.J., et al., “Effect of Apolipoprotein E Genotype and Diet on Apolipoprotein E Lipidation and Amyloid Peptides: Randomized Clinical Trial,” JAMA Neurol. June 2013; 17:1-9. “Saturated Fat May Make the Brain Vulnerable to Alzheimer’s,” Medlineplus web site, June 17, 2013; www.medlineplus.gov, last accessed June 24, 2013. “The Human Brain,” The Franklin Institute web site; www.fi.edu.com, last accessed June 24, 2013.